October 2009 for Sudha was a month that began with charitable hearts. Her Samudhaaya Foundation took part in the ‘Joy of Giving’ week celebrations, organized by Give India. Samudhaaya Foundation was prominently present at the NGO Exhibition on 1 October at the Chennai Trade Centre. The Exhibition offered a platform for NGOs to showcase the various causes they were championing for. This also gave an opportunity for the public to be aware of the miseries of the needy surrounding each of us, and shook up the minds and hearts, bringing to light the plight of the under privileged in various sectors and aspects. Samudhaaya Foundation had many curious, surprised and interested visitors, those who had hitherto not known of the charitable streak in Sudha and of activities of the Foundation that is so close to her heart. The event culminated with a capsule charity concert by Sudha, which was very well attended by all those who had helped for the causes and who saw and heard music coming to play…..a pivotal role in creating an oasis in the lives of the needy. An invocation concert on 3 October for the Global Festival ‘Receiving God’s Powers and Blessings’ by the Brahma Kumaris at Island Grounds, Chennai set the tone for a Bhakti filled month, as a concert for the Brahmotsavam at Tirupati on 8 October soon followed. The India International Centre Experience concert at Delhi was spun around the theme of the river Kaveri, ‘Songs to the Kaveri’. 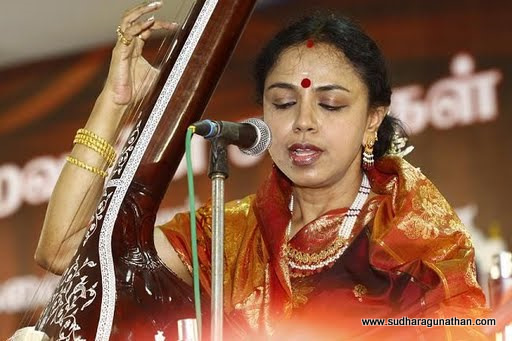 Representing the pristine Carnatic music from the South, Sudha had all elements of substance, detailing, segmenting, finesse and unique delivery packed into the concert. The Fourth Festival Musiquat (8-24 October 2009) at the Arab and Mediterranean Music Centre in Sidi Bou Said, Tunisia, featured Sudha on 21 October. It was congregation of global music and the Festival saw the likes of Kamel Ferjani (Tunisian traditional music in the Mazmoum mode), Aynur (Turkish classical music), Tárogató Ensemble (Hungarian traditional music), Salim Fergani and his Ensemble (Algerian classical music), Egscliglen (Mongol chants), Farida Parvin (Sufi music from Bangladesh), Rodrigo Costa Felix (Fado), Ustad Mahwash (Afghan Ghazals), Carmen Linares (Flamenco Puro from Spain) and Fronteras del Silencio (Argentina) all stringing the threads of different genres of music into one single garland of melody. The month ended with charity jostling for space along with music in Sudha’s busy calendar. It did come out successfully and ensured that it blocked dates for some serious activities for the causes during November! !